The face of the monitor's silver bezel is cleared of virtually everything, save for a neat back lit power button, and circular paddle which integrates channel changing and volume into one. The circular paddle also serves as a navigational control for moving through the graphical on screen menu system. 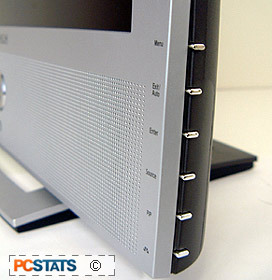 Easily accessible audio and video connectors line the first few inches on the left hand side of the 192MP monitor, and on the right, display control and menu buttons. Below the 19" a-si TFT/PVA LCD screen are a set of 3" 5W stereo speakers which actually knock out pretty good sound considering their small size. 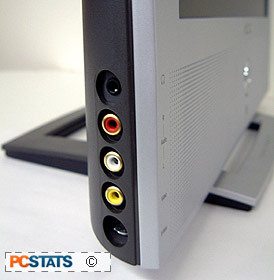 When using the Samsung 192MP for audio playback (say a CD or some MP3's), the monitor must be connected to a computer for the sound input feature to be accessible. In other words, if the 192MP is being used just as an LCD television, and the PC is off, you won't be able to input audio from a source, and listen to it on the builtin speakers. While watching some Television through the monitor, we were able to raise the volume to about 80% before the distortion began to kick in through the speakers. In the on screen menu, the 192MP can be configured acoustically for a couple audio pre-set; standard, music, movie, speech, or custom. 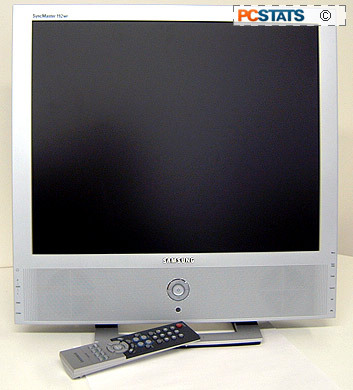 The Samsung Syncmaster 192MP wouldn't be much use as a television without a remote, would it? A pretty useful infrared remote is included along with monitor (with AAA batteries, imagine that! ), and allows us to control all aspects of the display from a good distance. Samsung have upgraded their remote control design from earlier versions which were somewhat un-userfriendly. 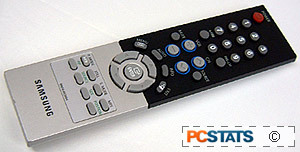 This remote looks nicer, and the buttons are easy to operate, and organized in logical fashion.